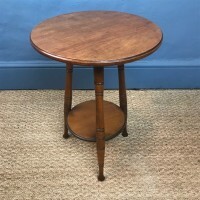 A fine quality Victorian satinwood and rosewood lamp table circa 1890 in Sheraton style by Halliday of Eton bearing a brass plaque to the underside inscribed with teh makers name A and F Halliday Art Furnishers by Special Appointment to The Queen High Street Eton Windsor. 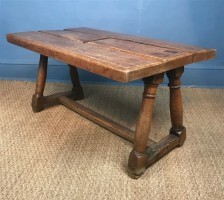 A late Georgian West Country oak Farm table circa 1820 in lovely untouched condition with 3 plank top on a square tapered legs. 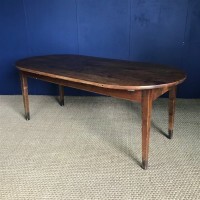 This Devon table has a particularly good untouched colour and plenty of legroom under the frieze. 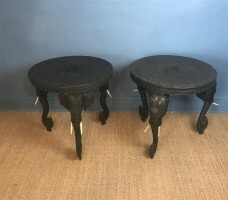 A matched pair of Bombay Presidency Black wood Elephant Tables circa 1890 in excellent solid condition both complete with all their 6 ivory tusks the tops carved with Hindu deities. 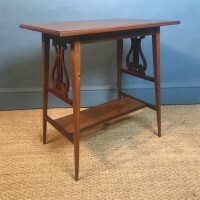 An Aesthetic Movement walnut table circa 1880 attributed to James Shoolbred and Sons London with pierced lyre end supports on square tapering legs. 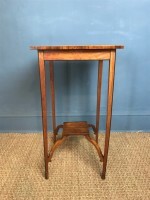 A rare Colonial Specimen Table circa 1840 inlaid in a variety of exotic woods on a tapering column and quadrapartite base. 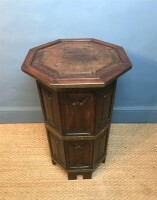 An Anglo Indian rosewood and brass banded octagonal table circa 1880 with a deep rich patina and deep carving to the panels. 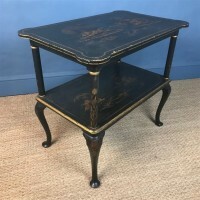 Read more: A William IV ebonised mahogany lamp table circa 1835. 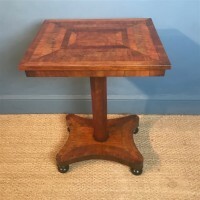 A George 111 satinwood and inlaid elliptical pier table circa 1790 with well figured West Indian satinwood crossbanded in faded rosewood and with a fan inlay to the back on square tapering gaitered legs. 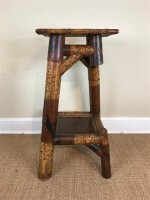 An unusual late 19th-century Aesthetic Movement bamboo lacquer two tier stand in the Japanese taste. 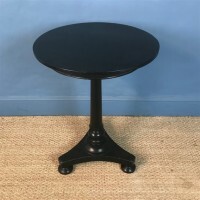 17 inches wide 17 inches 38 inches high. Read more: An unusual late 19th-century Aesthetic Movement bamboo lacquer two tier stand in the Japanese taste. 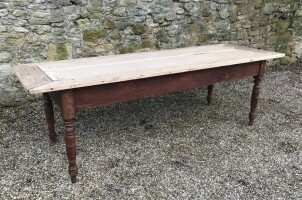 A late 18th century Welsh X frame pine top and oak Tavern table with a lovely rich original patination. 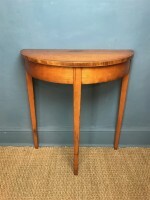 A late 19th c Jerusalem olive wood octagonal table circa 1900 with burr wood too and stellar inlay to the sides . 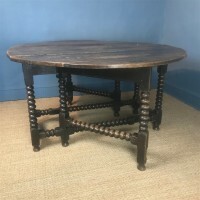 A 17th c oval oak gateleg table on bobbin turned legs with a lovely original crusty patinatation. .
A large French oval elm farmhouse table circa 1860 to seat 8 people in excellent solid condition with good legroom. 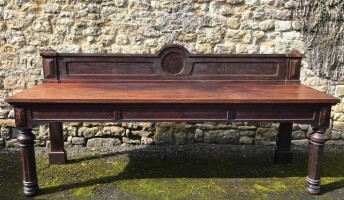 79 inches long 41 inches wide 30 inches high. 24 ins high to frieze. 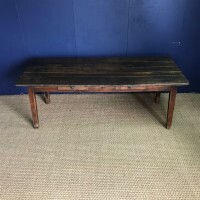 A French elm farmhouse table . Mid 19th c to seat 8-10 . 80 inches wide 35.5 inches deep 29 inches high. Legroom 24 inches to frieze. 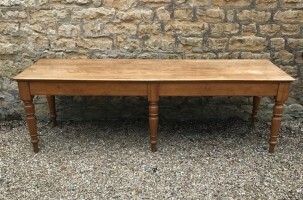 Read more: A French elm farmhouse table . 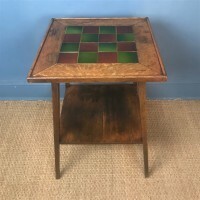 Mid 19th c to seat 8-10 . 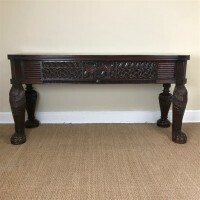 An Anglo Indian teak serving table circa 1840 in the Regency taste the front supports carved as lions legs the frieze with strong triple reeded edge and interlocking Mughal decoration below . 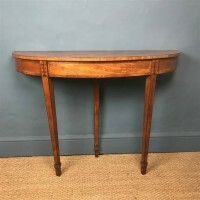 A large English birch wood serving table circa 1880 with a wonderful pale butter coloured top on six turned tapering legs. 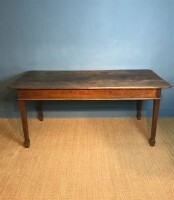 A large early Victorian Oregon Pine and Oak serving or hall table circa 1860 with panel back no frieze on turned and faceted legs. 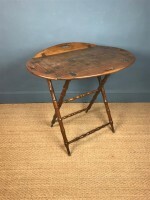 A Victorian pine kitchen table Yorkshire circa 1880 with two plank cleated top on turned legs with the original painted decoration.